Yuzuru Hanyu won Finlandia Trophy with 172.56 in the free. 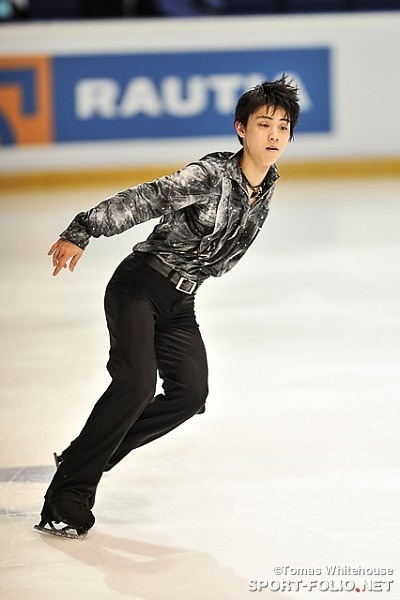 He landed two quads (a toe and a salchow) and two triple axels. Then he did a triple lutz-double toe and a triple lutz-single toe and a triple flip (wrong edge) and triple salchow. Richard Dornbush ranked second with 168.80 but had the best technical elements score of all. He did two quads (both toes) and two triple axels as well, but fell on a quad. After that he landed a triple lutz-triple toe, a triple flip, triple salchow and triple loop. Javier Fernandez, after being first in the short program, got the bronze medal with 154.43. He attempted two quads and nailed the first toe followed by a triple toe, but doubled a supposed to be quad salchow. Maybe a triple toe in the second half of the program was meant to be a quad too, anyway he went on with triple lutz-double toe, triple flip-one loop-double salchow, triple loop and single flip.